Data is the 21st-century gold. We, at InfoClutch, know how imperative it is for you to unearth it. 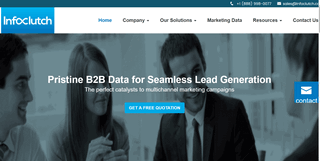 With over 70 million records in our database, we drill down and tap into critical business insights to power your marketing and sales cadre with highly reliable and efficient B2B marketing data. With exclusive focus on improving the marketability of our business data, we strive to offer optimum quality services throughout the sales and beyond. We endeavor to achieve highest service excellence, and foster an unabated commitment to promises as we proceed towards the goal.